Schwerer Gustav – This was the name given to a German 80 cm railway gun, a huge piece of artillery designed to be shot from a railway wagon. It was developed in the late 1930s by Krupp of Essen as artillery for the explicit purpose of destroying the main forts of the French Maginot Line during a siege. At the time, these were the strongest fortifications in existence. ‘Gustav’ could fire shells weighing seven tons to a distance 47 kilometers. When fully assembled the ‘Schwerer Gustav’ weighed nearly 1,350 tons. The Germans designed this piece of artillery to prepare for the Battle of France. 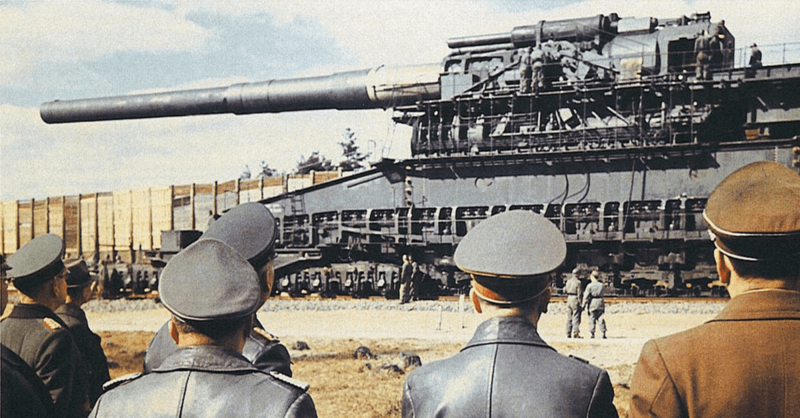 The biggest gun of WW II was not ready to do battle when the battle began. But it didn’t really matter because the Wehrmacht’s Blitzkrieg aggression through Belgium rapidly outflanked and isolated the Maginot Line’s static defenses, forcing them to surrender without any major losses and making the destruction of the fortifications unwarranted. ‘Schwerer Gustav’ was deployed later during the war to the Soviet Union. During the artillery bombardment of Sevastopol, which was part of Operation Barbarossa, among other things, the large gun destroyed an ammunition warehouse buried in layers of rock under a bay. Leningrad was the next stop for the 80 cm gun and probably was planned to be used in the Warsaw Uprising like other German heavy artillery weapons, but the rebellion was crushed before the heavy artillery was needed. The Germans demolished ‘Schwerer Gustav’in 1945, near the very end of WWII, so it wouldn’t be confiscated by the Soviet Army. It was the largest-caliber artillery weapon ever used in combat; the heaviest mobile artillery weapon ever built, considering the total weight, and fired the heaviest shells of any artillery gun. There are only two weapons that have larger caliber weaponry – the British Mallet’s Mortar and the American Little David mortar (both 90 cm).